Calvin Miller is a writer’s writera renaissance man of letters. His insightful devotional musings have blessed countless souls along their faith journeys for decades. He has quietly and steadily practiced his craft of wordsmithing, with every stroke of his metaphorical pen delving into the depth of the mystery of God’s incarnational work in this world. 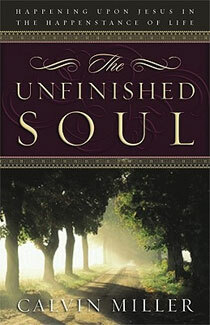 The Unfinished Soul represents another facet of Calvin Miller’s writingmore artistic, more introspective. Calvin mines his own inner being for the jewels of faith that are to be discovered theresome fully formed and shining like onyx while others are still forminggrace under pressure. The reader becomes a companion, observing the shaping of faithfulness in an unfinished soul.